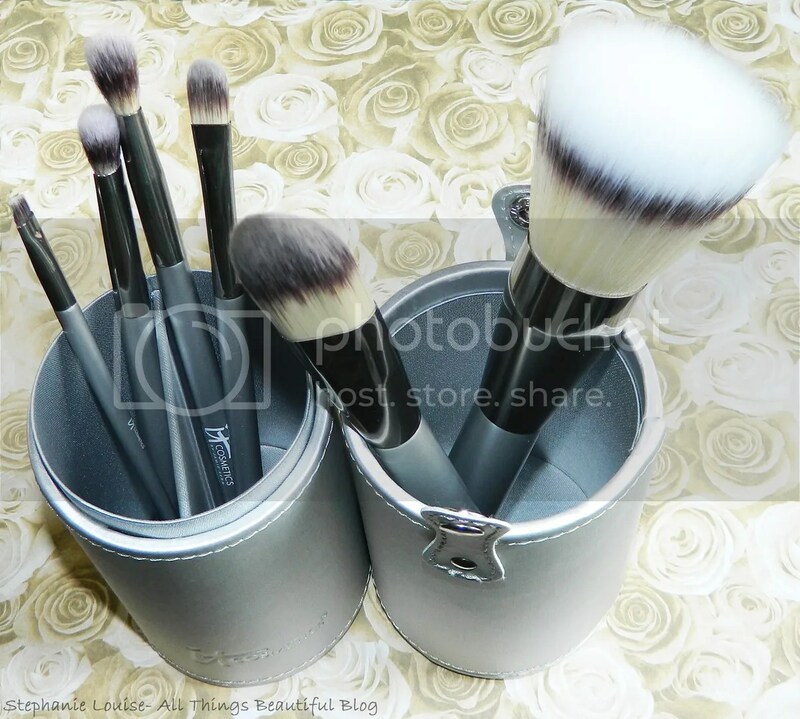 It Cosmetics Limited Edition Heavenly Luxe Vanity Brush Set Review! It Cosmetics has some of the best brushes & their Limited Edition Heavenly Luxe Vanity Brush Set is no exception! If you look back at my reviews of the It Cosmetics Heavenly Luxe Pointed Precision Luminizer Brush, Heavenly Luxe Buffing Airbrush Foundation Brush, & It Cosmetics French Boutique Blush Brush then you know I’m already a huge It Cosmetics brush fan. They’re spectacularly soft & luxurious. This set is crazy priced at a bargain as well, keep reading to find out why I love it! From QVC: A collection of six full-size, ultra-plush brushes, designed to give you a flawless airbrushed application. 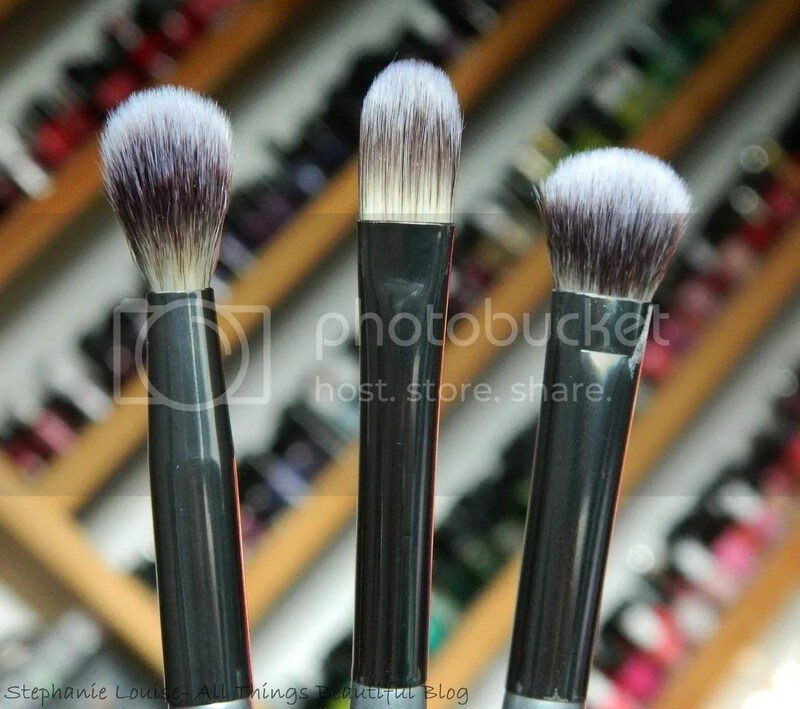 Store and display these gorgeous brushes in the provided ultra-luxe vanity case. Developed with plastic surgeons, each fabulous Heavenly Luxe brush distributes your favorite cosmetics evenly without tugging on the delicate skin and eye area. Perfect for even the most sensitive skin types. I love the packaging & storage for these brushes. I’ve been eying similar cases from other brands but had yet to pull the trigger. My favorite part is that unlike my brush roll, your brushes can breathe & I can set them out while travel to use easily. So happy with it! One side has a divider & the other is open. I use the divided side for smaller brushes & the bigger for fluffy, large brushes. 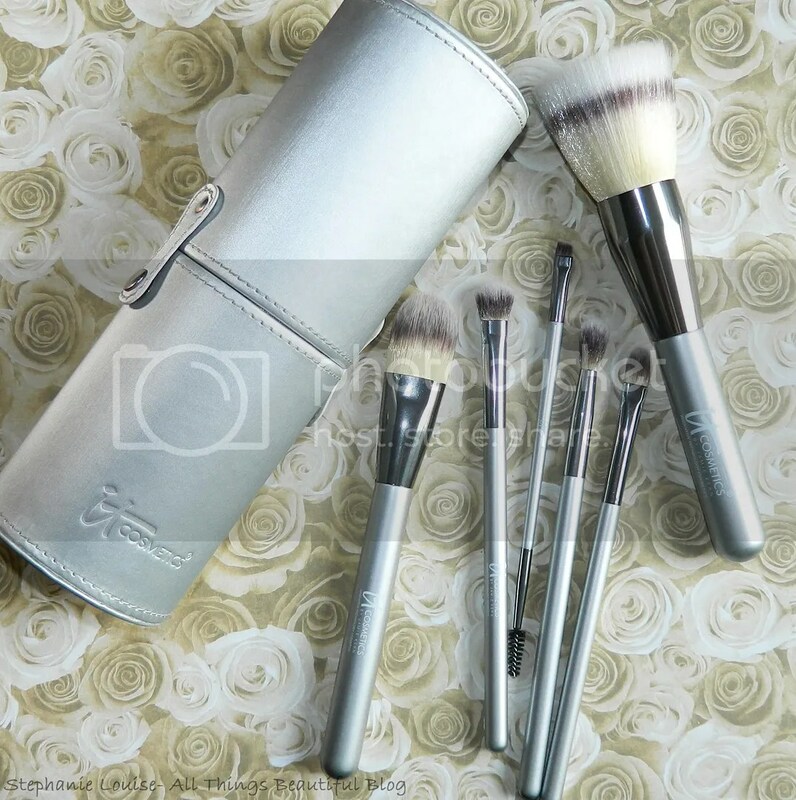 Included in the set along with the case are 6 brushes: Dual-Airbrush Multi-Powder Brush, Airbrush Flat Foundation Brush, Airbrush Flat Concealer Brush, Airbrush Crease Brush, Airbrush Allover Eyeshadow Brush, & a No-Tug Eyeliner and Brow Brush with Spooly. It Cosmetics Dual-Airbrush Multi-Powder Brush- Huge & giantly soft…this brush alone could retail for the price of this entire set. I personally can’t travel without a brush like this, a multi-tasker. Use it for powder, luminizer, blush, bronzer, anything you need a big brush for & airbrushed type look. Super soft it blends everything out beautifully. It Cosmetics Airbrush Flat Foundation Brush- This brush is soft enough for undereyes but firm enough for blending. I use this for both concealer & foundation, the curved tip is perfect for delicate areas. It Cosmetics No-Tug Eyeliner and Brow Brush with Spooly- I’ve been looking for a good quality brush like this! I love having both a spooly/brush comb & an angled eyebrow brush. This can also be used for eyeliner. I personally use brow powder daily so this is the perfect combo! It Cosmetics Airbrush Crease Brush, Airbrush Flat Concealer Brush, & Airbrush Allover Eyeshadow Brush- Although there is a concealer brush I still use the foundation brush for concealer & use this one for cream shadows & bases to blend. When I’m in a hurry I love having multi-use eye brushes & these are wonderfully soft. Absolutely no tugging which is so important around the eyes & face in general. This set is limited edition It Cosmetics Heavenly Luxe Vanity Brush Set is available from QVC (or The Shopping Channel internationally) & is only $39.50 which is ridiculously affordable. Seriously, I was shocked. Definitely worth way more so snap it up while you can!